UPDATED: Tue., April 11, 2017, 10:55 p.m. If local governments do nothing, Spokane County can expect to see 200 more homeless people on the streets every night. That’s the pitch that Rob McCann, director of the House of Charity, is making in a last-ditch effort to get funding for the downtown shelter to stay open 24 hours a day. The shelter has been housing several hundred homeless people each night in the downstairs common area since November, in addition to its regular 109 beds open for homeless men. It also expanded hours to serve as a day center for homeless people. In spite of a limited number of holdouts who spent the winter sleeping outside, most homeless people chose to spend nights indoors rather than brave the freezing temperatures. “We’ve sheltered all the homeless this past winter,” McCann said. The House of Charity is operated by Catholic Charities, which decided about a year ago it was no longer willing to subsidize the shelter at a deficit, as it had the previous several years. The nonprofit began asking local governments for help. The cost of keeping the House of Charity running around the clock is about $1.5 million a year. McCann said that’s a small ask. “We’re currently giving more to animal shelters than we are to human shelters in this region,” said McCann, referring to the amount local governments spend on contracts for animal control and shelters with the Spokane County Regional Animal Protection Service. The cities of Spokane and Spokane Valley both had contracts with SCRAPS for about $563,000 and $291,000 in 2016, respectively. This year, Spokane County is paying $448,000 for service in unincorporated areas. SCRAPS also has contracts with six other cities and generates nearly half of its own revenue through fees and licensing. Expanded hours at the House of Charity have been possible because of about $1 million in funding from the city of Spokane over the past two years. But city officials now say they’ve paid all they can and it’s time for the county and Spokane Valley to chip in. McCann said he’s written letters to every county commissioner and Spokane Valley City Council member. So far, he’s received few responses and no commitments. Councilman Ed Pace said the council received McCann’s letters, and some members have met with him, but the council has not had an official discussion about House of Charity proposals. A city spokeswoman said McCann could apply for funding through a program that supports non-city agencies. Commissioners Shelly O’Quinn, Josh Kerns and Al French weren’t immediately available Tuesday evening to discuss the House of Charity situation, but O’Quinn indicated in an email that they weren’t expecting the funding shortfall in 2017. She provided documents showing the county has spent $513,000 on homeless shelters over the past two years and nearly $3.65 million on affordable housing projects since 2011. McCann said the House of Charity situation has changed since the county made an additional one-time payment of $50,000 to keep the shelter from cutting its hours last summer. He said he had expected funding from the city of Spokane and other sources to cover 2017 expenses. The city contributed $250,000 last year and an additional $700,000 this year, set aside through a larger budget allotment for emergency shelters and funneling existing money to the project, rather than other programs, City Council President Ben Stuckart said. 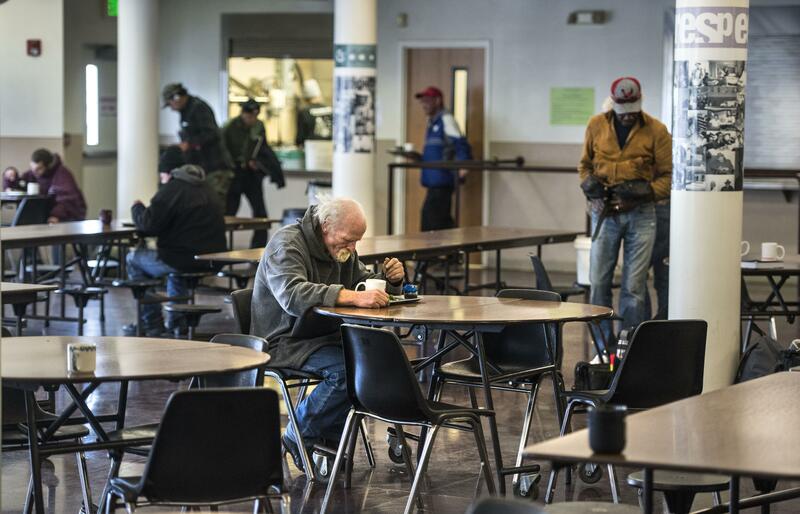 Federal and city funding for homelessness have shifted in the past five years toward a focus on permanent housing projects like the Father Bach Haven, also run by Catholic Charities. While those apartments are the most cost-effective long-term solution for housing homeless people, the funding shift has left shelters making due with fewer resources. McCann said funding expanded shelter hours is cheaper for taxpayers than subsidizing the ambulances, emergency room visits and jail stays of chronically homeless people. When people have housing and a place to stay warm, they’re less likely to use more expensive emergency services. The city’s hotspotter program, which tracks people who frequently end up in jail and the emergency room, collects data on public spending for individuals before and after they receive housing through the program. In one case, a person’s emergency visits and jail stays cost about $16,800 a month before the program and just $638 after, according to fire department data. A bed at the House of Charity costs less than $13 per night, McCann said. “These are simple math decisions,” he said. The combined budgets for Spokane, Spokane Valley and Spokane County were about $1.2 billion for 2017, making the House of Charity’s request well under 1 percent of those budgets. McCann said cities like Seattle, Portland and San Francisco would “jump at the chance to get a solution to homelessness” for such a small cost. In total, Spokane spends about $6 million per year for homeless services. The annual homeless count found 961 homeless people living in the city, meaning the city spent about $6,000 per homeless person last year. Total spending on housing and human services is about $13 million, said Jonathan Mallahan, director of community and neighborhood services. Seattle’s human services department says it spends $40.8 million a year on homelessness, or about $14,500 per homeless individual. San Francisco’s budget for homeless services was $241 million in 2016, according to the San Francisco Chronicle. McCann said some elected officials are reluctant to spend money on homelessness because of a perception that homeless people from other parts of the country will be drawn to Spokane if services are generous. In response, House of Charity staff started polling people receiving meals and found about 85 percent of their clients were born within 50 miles of Spokane. Many of the rest have been here for years, he said. “These are our people. They’re not someone else’s people,” he said. Condon said the 24/7 shelter gave social workers the opportunity to meet with the region’s homeless population and identify what services are needed. “You have an opportunity to engage with them, to figure out whether it’s a mental illness, or an addiction, or other things, and to really get us to a point of having solutions for those that find themselves homeless,” the mayor said. Stuckart, who toured the cities of Portland and Boise with Condon earlier this year to learn how they pay for sheltering the homeless, said the responsibility of supporting the population couldn’t fall on the city’s shoulders alone. Stuckart said private businesses should also help with funding. The Downtown Spokane Partnership gave $20,000 last year in support of the shelter project. “In Boise, for example, the only shelters they have are completely funded by private individuals and private industry,” Stuckart said. Other entities need to be at the table before Spokane should consider spending more, City Councilwoman Karen Stratton said. “I think, first, we need to do a thorough check to see if other municipalities, or the county, want to be part of the collaboration to fund these shelters,” she said. Staff writers Chad Sokol and Pia Hallenberg contributed reporting. Published: April 11, 2017, 8:20 p.m. Updated: April 11, 2017, 10:55 p.m.